The 1st World Youth Bridge Congress was held in Istanbul, Turkey, from 15 to 23 August 2009, hosted at the Yeditepe University, attended participants from 29 countries. 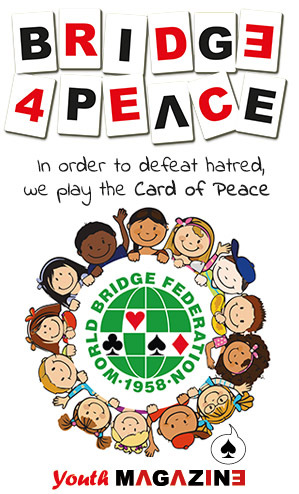 Young players from all member countries of the World Bridge Federation were invited to participate in this new competition, designed to be a massive event. 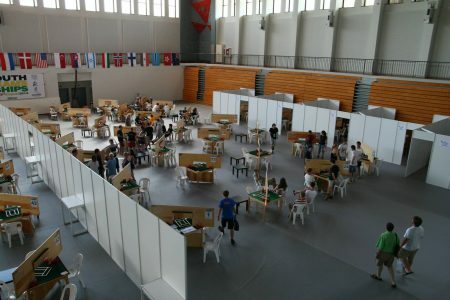 Accordingly, transnational combinations were allowed in all events, and there were no restrictions on the number of players who could participate from any single country. 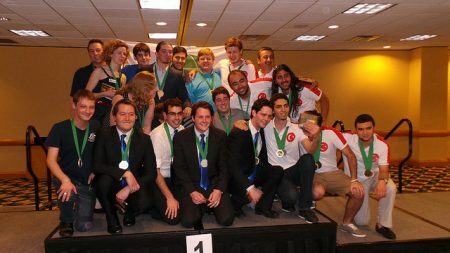 Teams were played according to the Swiss format, as well as Board-A-match. 1. ZLATAN: Simon Ekenberg, Simon Hult, Rodrigo Garcia De Rosa, Giuseppe Delle Cave, Daniel Gullberg, Johan Karlsson, Marshall Lewis (NPC). 2. NORWAY: Christian Bakke, Tor Eivind Grude, Kristoffer Hegge, Harald Eide. 3. GRESWE AXON: Ola Rimstedt, Ioannis Oikonomopoulos, Mikael Rimstedt, Adam Kaplan, Giorgos Oikonomopoulos (Coach). 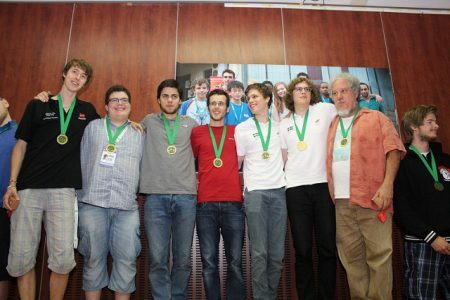 The 2015 Youth Open Bridge Championships were held once again in Opatija, which is proving an excellent and very popular bridge venue. 1. WAR OF ROSES (USA): Kevin Dwyer, Zachary Grossack, Marius, Agica, Adam Kaplan, Owen Lien, Adam Grossack, Michael Rosenberg (NPC). 2. AUSTRALIA: Nathan Howard, Peter Hollands, Lauren Travis, Justin Howard, Ellena Moskovsky, Maxim Henbest, Ishmael Del’Monte (NPC), Alex Smirnov (Coach). 3. TURKEY: Altug Gobekli, Erkmen Aydogdu, Sarper Uslupehlivan, Akin Koclar, Muhammet Ozgur, Berk Gokce. The 3rd edition was held at the Hyatt Regency Hotel in Atlanta. 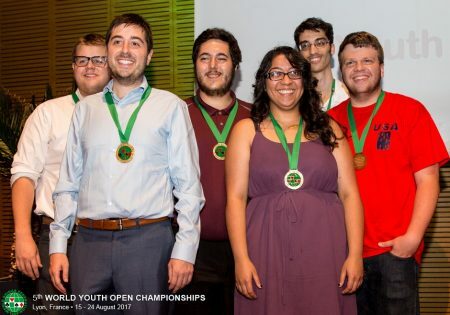 For the 3rd World Youth Bridge Teams Championship the regulations required that pairs and teams must consist of members from the same NBO. 1. NETHERLANDS JUNIORS: Berend van den Bos, Joris van den Lankveld, Aarnout Helmich, Gerbrand Hop, Kees Tammens (NPC). 2. ARGENTINA-URUGUAY: Maximo Crusizio, Rodrigo García da Rosa, Felipe José Ferro, Alejandro Scanavino. 3. NETHERLANDS-ROMANIA: Bob Drijver, Ernst Wackwitz, Marius Agica Radu Nistor. The 2nd edition was held at the Congress Centre Tamaris in Opatija. 27 teams from 19 countries entered the Swiss/KO Teams. The team Netherlands Juniors had a comfortable victory over the Argentina-Uruguay team, 145-68. 1. JAPAN-CZECH: Noriaki Koike (Japan, Michal Kopecky (Czech Rep.), Milan Macura (Czech Rep.), Hiroaki Miura (Japan). 2. ITALY RED: Massimiliano Di Franco, Arrigo Franchi, Andrea Manno, Aldo Paparo. 3. USA BLUE: Jason Chiu, Kevin Dwyer, Kevin Fay, Jeremy Fournier, Justin Lall, Matthew Meckstroth, James Marsch Sternerberg (Coach), Howard Weinstein (NPC). In the 48-board Final Italy started confidently and led by 22 IMPs after two sets. But Japan-Czech Republic again showed its grit by storming back in the last segment to win 95-80 to become the 1st World Youth Congress Swiss/KO Champions. USA-Blue won the playoff for 3rd place with a 86-77 victory over Netherlands-Red.